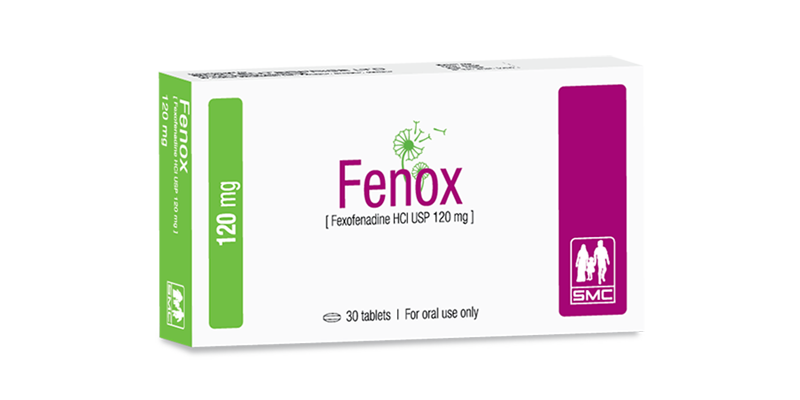 Fenox tablet: Each film coated tablet contains Fexofenadine Hydrochloride USP 120 mg.
Fexofenadine Hydrochloride is an antihistamine with selective peripheral H1-receptor antagonist activity. This leads to relief of the allergic symptoms. Unlike most other antihistamines, Fexofenadine does not cross Blood Brain Barrier, and therefore, does not cause drowsiness. Seasonal Allergic Rhinitis and Chronic Idiopathic Urticaria: Adults and Children > 12 years: 60 mg (1/2 tablet) twice daily or 120 mg (1 tablet) once daily or 180 mg (1.5 tablet) once daily with water. Children 6 to 11 years: 30 mg twice daily. There is no adequate and well controlled study in pregnant women. Fexofenadine should be used during pregnancy only if the potential benefit justifies the potential risk to the fetus. It is not known whether Fexofenadine is excreted in human milk or not. Caution should be exercised when Fexofenadine is administered to a nursing woman. Fexofenadine is generally well tolerated. The most commonly reported adverse events are headache, nausea and dizziness. Fexofenadine is contraindicated in patients with known hypersensitivity to any of the ingredients. Plasma concentrations of Fexofenadine have been increased when given with Erythromycin or Ketoconazole. Antacid containing Aluminium and Magnesium Hydroxide reduces the absorption of Fexofenadine. Fruit juices including grape fruit may reduce the bioavailability of Fexofenadine and use together should be avoided. Fenox tablet: Each box contains 3x10’s tablet in blister pack.